Notify every WordPress post change! You want to be notified when one of your contributors submitted a new post for revision or an editor published one? Vice versa you want to notify your contributors when their posts got published? This is just the beginning of what you can achieve with Post Status Notifier (PSN)! 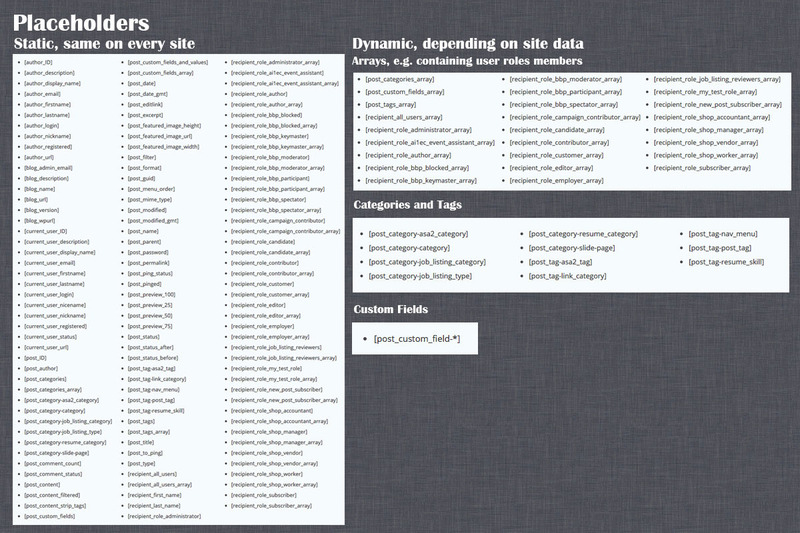 It works with all kind of custom post types, supports all custom taxonomies like categories and tags of other plugins. You can grab all these taxonomy values and custom fields attached to a post and use them as placeholders in your custom notification texts. PSN has a powerful conditional template syntax featuring many filters and functions to get the most out of the placeholders! 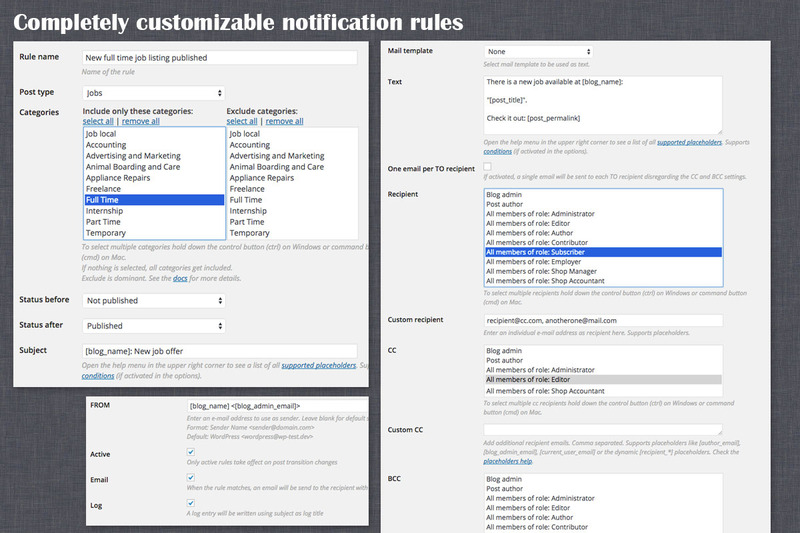 Define as many notification rules as you need with all kind of settings, like custom CC, BCC and FROM emails addresses. PSN is extensible! Build your custom module to implement a new notification service. PSN works great with plugins like WP Job Manager (read the blog post), Calendarize.it (read the blog post), Crowdfunding by Astoundify (read the blog post), WP User Frontend (read the blog post) or Advanced Custom Fields, just to name a few. The possibilities are endless. 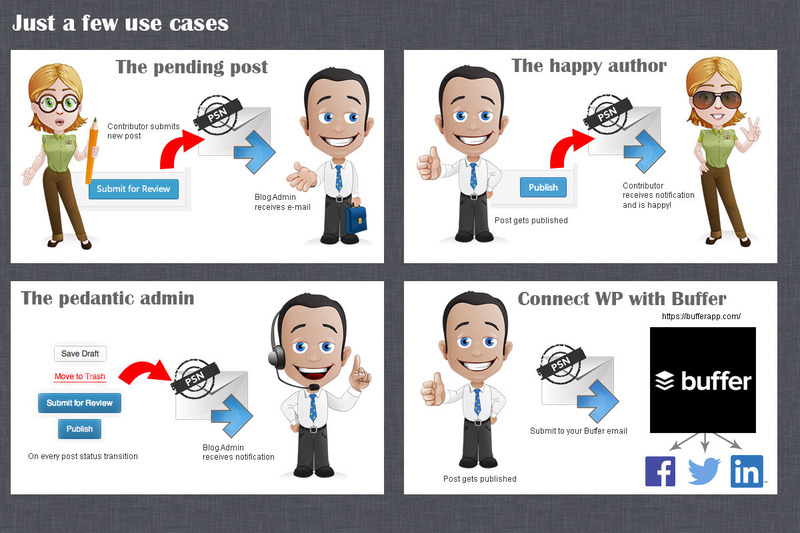 Want to automate your publishing workflow with Buffer? No problem! And if you are looking for a solution to create custom email notifications for user submitted posts, PSN works great together with Frontend Publishing Pro, also available on CodeCanyon. 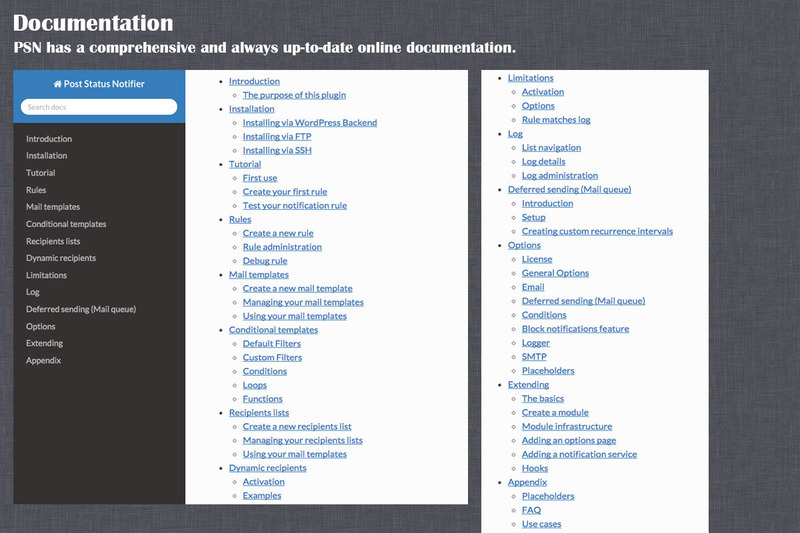 New rule condition: Post ID whitelist / blacklist, see documentation page. Custom sender e-mail. Define the notification sender (FROM) per rule or as a default in the options. Store your recipients email addresses in custom lists. No need to create WordPress user accounts for each recipient. Supports SMTP. You find all necessary SMTP settings to connect your SMTP server in the options section. Here are some simple examples of how you can use Post Status Notifier. You can easily adapt the notification rules to your own use case. You host a blog / website with several authors and you want to be informed when a new post is ready for review? This rule sends a notification email to the blog admin when a new post got submitted for review. This rule sends an email to the author of a post when it got published. This rule is for blog admins who want to be informed about every single post status change. If you are using Buffer for automatically sharing your WordPress posts with your social profiles, PSN can do the job for you. See how it works in this blog post. Fixed: Some PSN database tables have been created with type MyISAM. This has been removed to create default type which will be InnoDB in most cases. Fixed: The initialization procedure of the plugin has been improved. Bugfix: Selftester could produce an error message about insufficient permissions. Major improvements for the support of Categories and Tags. Major improvements for the support of Scheduled Posts. 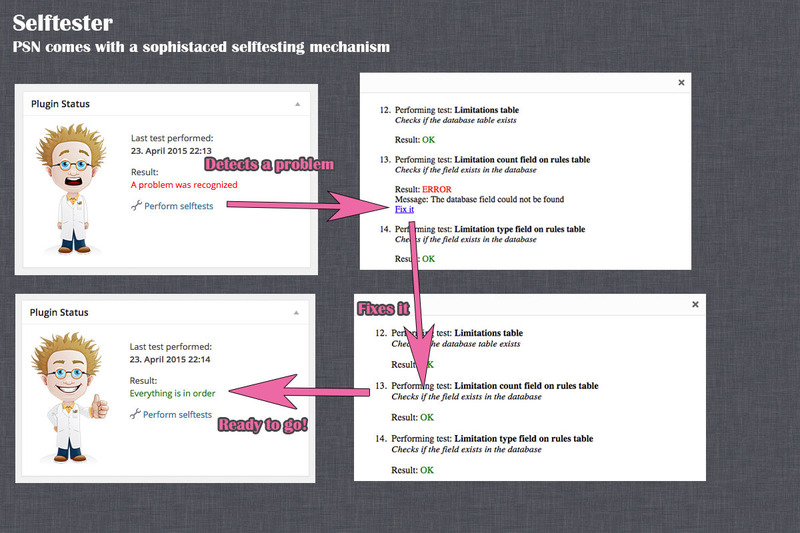 New feature: Support for conditions, loops, functions and filters in subject and body texts. Enables to access any kind of data attached to a post. Allows to create dynamic texts. New feature: Block notifications options in Post submit box. Lets you decide to completely block notifications before you update / create a post. New feature: One email per TO recipient. Notifications can get send in a loop with one email per TO recipient disregarding CC and BCC recipients. This feature is has Beta status. New placeholder: [recipient_first_name] Only works in “One email per TO recipient” mode. The firstname of the recipient if it is available in the user profile. New placeholder: [recipient_last_name] Only works in “One email per TO recipient” mode. The lastname of the recipient if it is available in the user profile. 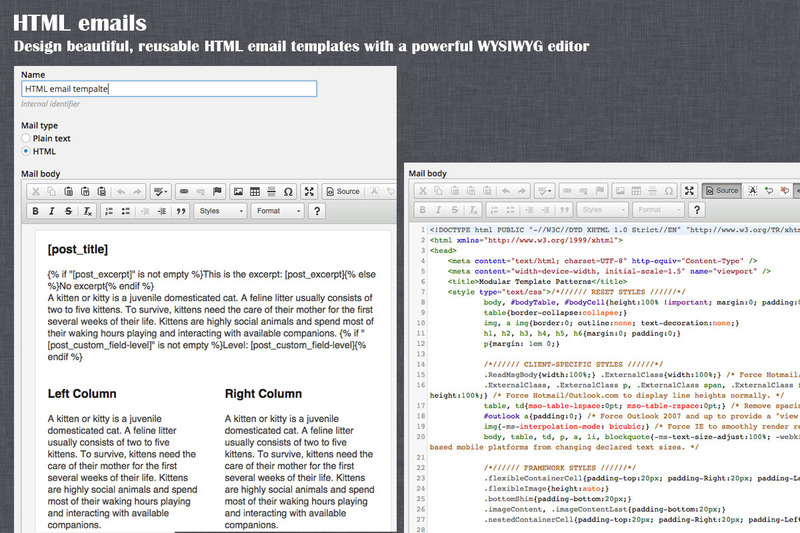 New feature: HTML mail support and email templates. 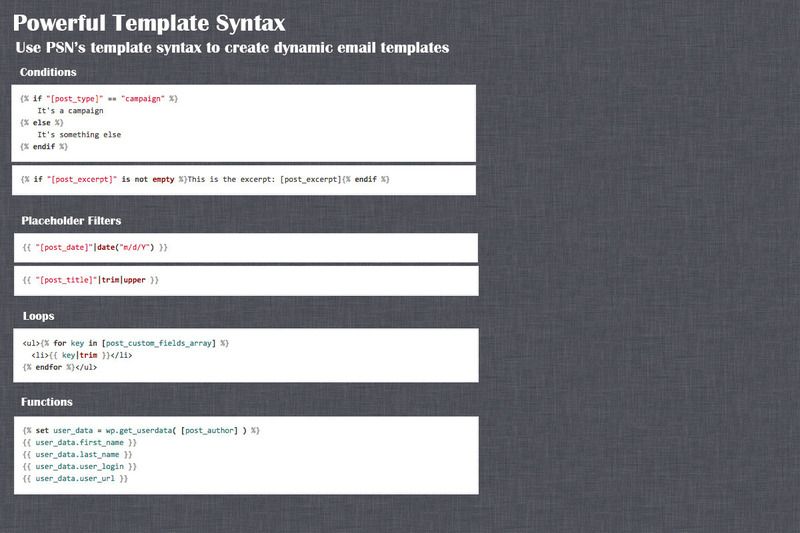 Prepare your email templates once and select them for different notification rules. New feature: Auto-update via WordPress backend. Never have to upload the files via FTP again. You have to enter your license code in the plugin’s settings. New feature: More flexible To, Cc, Bcc selection. Multiple selections are possible now. New feature: Editor restriction. Select one or more roles the editor of a post must be member of so that the notification will be generated. New feature: Recipients lists. Manage email addresses without the need to create user accounts. New custom placeholders which will specifically match custom categories and tags registered with your blog. 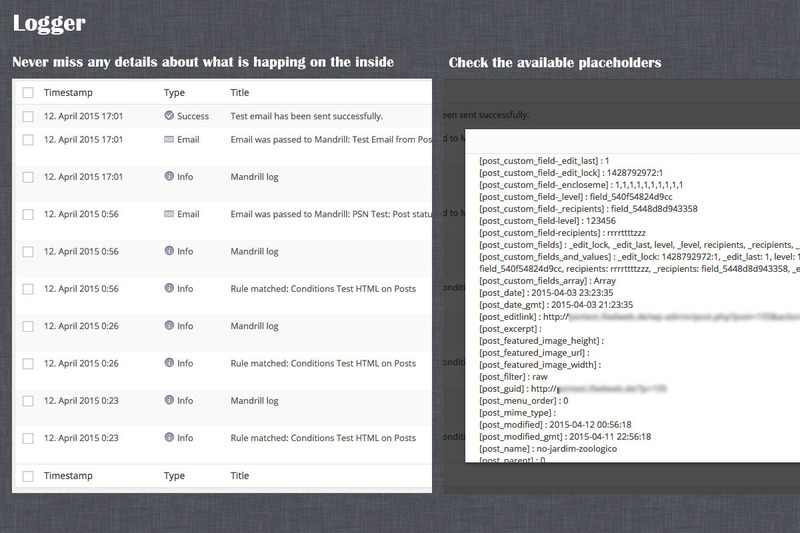 New feature:Dynamic placeholders: You will be able to fetch every custom field attached to your posts. New feature: Placeholder filters. This is a very powerful feature. You can use all filters of the famous PHP template engine Twig to manipulate the output of all placeholders PSN offers you, including the new dynamic placeholders. New feature: New recipient type “Individual e-mail”. Enter a custom e-mail address as main recipient (TO). New feature: Custom sender e-mail. Define the notification sender per rule or as a default in the options. New notification rule status “Not published”. This will match every post status but “publish”. New feature: Bcc field. Set Bcc recipients for your notification rules. 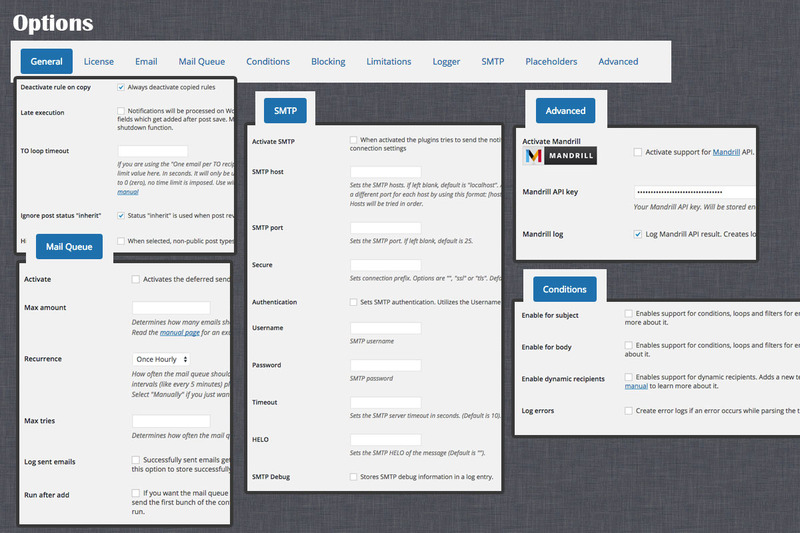 New feature: SMTP mode. If you want to send many notifications and have a SMTP mail server, PSN now supports it. You find all necessary SMTP settings in the options section. New feature: Plugin selftester. The plugin ships with some selftesting routines you can trigger manually in the plugin dashboard.